It doesn’t take much looking at this 1956 Ford F100 pickup named “Snakebit” to see what makes it special. 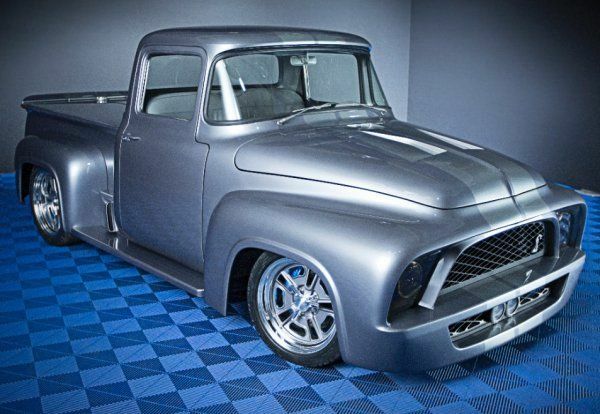 Aside from the fact that it is spotless refinished from the ground up, this classic Ford pickup wears a front end that sports some very obvious design cues from the modern Shelby GT500 Mustang. This front end looks more like a the front end of a 2007 Shelby GT500 was molded onto the nose of a 1956 Ford F100 with a custom dual vented hood to add even more muscle car feel to this old school pickup. Inside, Snakebit features a custom leather interior with a classically styled bench seat with more custom work on the dash and door panels. Under the hood of the Snakebit 1956 Ford F100 pickup is a supercharged 5.4L Ford Racing V8, similar to the one found in previous GT500 Mustangs with somewhere in the area of 550 horsepower being sent to the rear wheels via a proper 6-speed manual transmission. Helping put all of that power to the road is a set of high performance tires wrapped around the custom classic styled 20 inch rear wheels while smaller 18 wheels up front work with the modern suspension system and a high performance braking system to help this Ford truck handle as well as it accelerates. You might be wondering why Gene Simmons and Shannon Tweed were involved with the debut and that rests in the details of this unique pickup. Tweed is from Saskatoon Saskatchewan, Canada and that is one of only two Canadian provinces that does not have a dedicated children’s hospital. Tom Foster, president of Saskatoon-based customizer Industrial Machine & Manufacturing, dreamed up this unique pickup and with local celebrity Shannon Tweed on board, the Wheels of Dreams group was assembled to design and build the unique truck shown here with the help of the Ford dealership association in Saskatchewan and the many other partners who provided parts and/or time to this project including Ford Motor Company. Now that it is completed, Project Snakebit will tour the US and Canada before ending up the Barrett Jackson Auto Auction in 2014 where it will be auctioned off. Once the final gavel has sounded the funds raised through the sale of this unique 1956 Ford F100 will go to help build a proper children’s hospital in Saskatchewan. Considering that Tweed is from that region of Canada, the blonde bombshell and her uber famous rocker husband seemed like the perfect people to help unveil the truck in Vegas and after that red carpet introduction – the striking design of this project truck will help to draw the attention of tens of thousands of show-goers to the needs to the people of Saskatchewan.